Don't you just love SM? 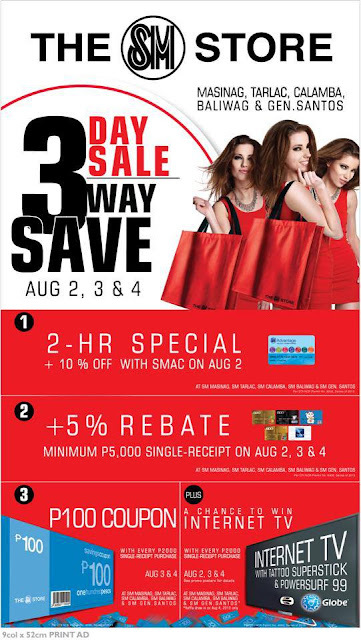 It's the time to get ready for more shopping as SM is having a 3 Day Sale 3 Way Save at The SM Stores in Masinag, Tarlac, Calamba, Baliwag & General Santos. Sale will be on August 2-4, 2013. Customers can get 10% off during their 2 hour special and am additional 5% rebate* and P100 coupon* & chance to win an internet TV*!